In 2015 Keep Dalton-Whitfield Beautiful's committee for Beautification and Community Greening established a mini-grant for in-school beautification projects. Seven schools were recipients of the first round of grants which were issued in the Fall of 2015 in honor of National Planting Day, a program from Keep America Beautiful. Schools from the Dalton/Whitfield area are invited to apply for funding to help implement a project related to beautification. Beautification grants range from a minimum of $100 to a maximum of $250. Applications are due in early September, with winners announced the following week. Projects take place in the fall and are completed no later than the first week of December. Project summaries and photos are sent in by mid-December before winter break. Congratulations to the grant winners! We're so proud of how you involved the students in growing and planting at school. Below is a list of the schools and a summary of their project. Our original plan was to plant trees for each team in the 8th grade. After meeting with the head of maintenance for the school system, we realized that our original plan had to be altered. The drainage system at the school and other constraints prohibited trees from being planted. We opted instead for an 8th grade garden. It will still have a plaque and will be in the same area as the grant proposed. It will, however, be a butterfly garden. We had the students research native plants that would help our ecosystem. They came up with five different plants that we could use and did the research on how to plant and where and when to plant the flowers. We have made the seed balls we will plant in the spring when it is time. We have started preparing the plot, too. Even though the project has changed in its scope, it still meets the intended goal by beautifying an area for the 8th graders and having them take ownership of leaving a legacy at their school. Once we introduced this to our students as their "legacy" after they left the school, they really took ownership of it. They like the idea of leaving the school a better place than when they came. Since the money had to be spent by December, but it’s not the correct planting time, we had a day of work prepping the seed balls for the garden. The students had a lot of fun getting dirty and organizing the plants. The goal of our project was to create a welcoming outdoor learning environment for our high school. We believe that this has been achieved and continue to grow through our benches and outdoor whiteboard. We also believe that the teachers of our school will now incorporate this previously unused space into their lesson plans to further our student learning. We also believe that the landscaping that we have completed has helped to enhance the overall appearance of our school. This project was much more challenging than we first believed. Because of the coordination with so many entities from businesses to other schools, it has been rewarding and exhausting. We have been challenged by the weather and the coordination of very busy schedules. The amount of people that came together to help and work on the weekends is very memorable. The transformation from a lonely, unkempt courtyard to a fun, exciting, and beautiful place will be revealed during the spring, but the hard work and dedication that began with a small group of teens is phenomenal. Now, our students can re-purpose, recycle, garden, build, and professionally speak with businesses and community members/leaders. Working with a consultant from Fiddleheads Garden Center we were able to choose plants for out Georgia Natives Butterfly Garden that are found naturally in Georgia and are tolerant of full sun and heat. Some varieties, including Cherokee Rose, are not available at this time and will be purchased in the spring. We look forward to spring when the plants will begin to show. The students from the Autism Resource Class were curious about the process of planting perennials - "We're gonna do what with this?" About 25 general education students were also involved pulling weeds and preparing the ground, gaining community service hours for the school Y-Club. Many have asked to continue to work on other areas of the campus. We were also able to connect the project to learning in all three grade levels: 6th grade science study of soil; 7th grade science study of plant reproduction; 8th grade Georgia Studies study of native plants. Students learned about pollinating and feeding the wildlife despite living in the city. Students learned that working plants that are native to GA can look pretty and do a job for the environment. Students were excited about fixing up the picnic area. One student has a parent that eats with her at the school and expressed to everyone that she can't wait to tell her Mom and show her all the hard work they did. They are all excited to see the berries in the spring. The knowledge that bushes can be pretty and do a job was the best realization for this latest project. Before we had a "garden" area that was growing weeds that were knee high and there wasn't a plant of flower in sight. The student have a picnic area outside of the cafeteria that they can choose to sit under the sun and eat but the scenery was sad and bare. The grant and donations allowed for a complete makeover of the garden/picnic area which made for a beautiful view for students and teachers. MIHS Pep Club was in charge of this garden/picnic makeover project but we had students who saw what we were doing and asked if they could help. We couldn't have done it without them. We had teachers who saw students working on the garden area, every day after school, and some teachers came out and helped and others purchase waters, snacks, and pizza for them. Emails were sent out to other teachers and thy were proud that these students loved their school so much. Students who didn't work on the project commented on how they loved it. A total of seven hundred forty-six students from Pre-Kindergarten to 5th grade participated in this project to add new plants to a pollinator garden at the school. The pollinator garden was built last Spring and the goal of the project was to redo some of the raised bedding and beautify the garden area. The garden is located near the pick-up area of the school and the work done by the students, staff, and administration helped beautify the area to make it appear more welcoming to the community. The students learned about native Georgia plants and shrubs while choosing plants that would help draw pollinators in. Blueberry bushes were chosen by the students so that the shrubs would draw in pollinators and create food for the birds. The students worked to learn how to identify both the plants and pollinators present in the garden. The students shared a sense of pride in their work stating, “We did a good job.” The garden will continue to serve as a learning experience for the students and as the plants grow they will have both fruits and vegetables in the coming years. The community has supported the students work and has given them many compliments on the garden’s appearance. This project enabled students to replace the landscaping that had been removed or destroyed after a recent renovation to the front of their school. The project was part of their Nursery-Landscape Course curriculum and allowed the students to complete six hours as coursework. Eleven more hours were spent as volunteer time. The DHS Horticulture classes cloned and divided some of the items, such as Maiden Grass and SunPatiens to extend the use of their funds and provide the students with hands-on experience. When DHS held the Community Open House for Dalton’s 100th Anniversary the attendees gave numerous compliments on the design and beauty of the area. This project enabled students to transform the entrance area to their school by planting native plants and adding topsoil. The project allowed students to better understand the values of different types of native plants, as well as the importance of their ecosystems, their biochemical ecosystems, and their sustainability. Students also learned about the low water requirements, natural resistance to insects and diseases, and low maintenance of the plants chosen. The plants will attract pollinators such as bees and birds to the area. As the students worked on the garden, they were surprised by the smell of the topsoil as the smell spread through the school when it was placed. Thanks to the grant and the hard work of the students and faculty, the entrance to the school serves to beautify the community while simultaneously teaching students about native plants and pollinators. The school supplied the topsoil and the fund from the grant bought the native plants. The second graders and the STEM lab at Blue Ridge Elementary collaborated to create a certified butterfly garden through the North American Butterfly Association (NABA). The project helped beautify the school and assist the students in learning about gardening and the butterfly life cycle. Students will witness the butterfly life cycle within the classroom beginning in April and will then release the butterflies into the garden. The grant also helped provide funds for the creation of a pond in the garden as its’ water source. Dalton Middle School’s 7th-grade class updated their bird sanctuary by building a pollinator garden near their birdfeeders. The students study birds throughout the year and use this sanctuary for direct observation. Students planted native plants chosen to attract hummingbirds. The garden previously had wildflowers and multiple birdfeeders and the addition of the pollinator garden will help attract a larger number of hummingbirds to the sanctuary. The class maintains the feeders throughout the year and uses them for the Cornell Lab of Ornithology Annual Feeder Watch. This project sought to beautify the front area of the Dalton Institute of Esthetics and Cosmetology located in Bryman’s Plaza to provide a more welcoming atmosphere for the students and community. Students and instructors worked together to plant small perennial plants and dwarf variety trees. Twelve participants donated three hours of time to complete the project. This project was implemented during the fall season throughout Roan School campus. The garden club planted native bulbs around the campus. The Roan School Garden Club planned where the bulbs were planted, planted the bulbs, and helped the growth of the plants by adding Miracle Grow Potting Mix with Fertilizer. The purpose of the project is to help students learn the importance of pollination and what could happen to our ecosystem if pollinators are not present to help the plants. In the Spring and Summer, the bulbs will be ready to bloom and help provide a pollinator-friendly ecosystem and provide the students direct experience with the process of pollination. Three of the board members from KDWB came and helped plant the starting of Roan School’s Daffodil Field. The students were so excited to share this part of the adventure with the board members and show them all the hard work that they had put into providing plants that would help with pollination in the future. They were pleased to enlist the help of Nancy Wright Reynolds and three members of her Girl Scout Troop #970 that took it upon themselves to plant Lily Bulbs, clean out the flower bed, and lay new soil for the bulbs in the pollinator gardens. A total of twenty-five participants dedicated ten hours to complete this beautification project. When Morris Innovative High School (MIHS) was remodeled a few years ago, a large brick planter was installed. A couple of years ago some Junipers were planted, but the rest of the planter was bare and void of plants. This project allowed additional plants, mainly perennials, to be planted in the void area. In addition, a hardwood/cypress mulch was placed around the plants helping hold the moisture as well as reduce weeds. The planter box is the first thing visitors, students, and staff members see when entering MIHS. Furthermore, as the front of the building is all brick with a large paved area, this project provides color and beauty to the front of the school promoting a more welcoming vision and environment. Dr. William Lanford stated about working on the beautification project, “My wife, the other Dr. Lanford, helped me on a brisk Sunday afternoon. This gave us time to do what we do, spend time together working in the yard.” Five Springs Nursery, a wholesale plant distributor, helped provide this project with quality plants within the budget. The Leverne Damron Reading Garden was dedicated years ago to long time Tunnel Hill principal Leverne Damron. The original plants outgrew the area and had to be removed when a water leak became apparent in the media center. The removal of the original plants left the area looking bare. Tunnel Hill wanted to continue to honor Mr. Damron by replanting the garden. The goal of this project was to recreate their school reading garden, so that it will once again provide a nice outdoor setting for students to read or relax. It also provides a nicer outside entrance to our media center. The ultimate goal for the garden is to continue the plantings using butterfly friendly plants which are native to the area. The Grant helped them purchase a concrete table for students to use, and plants. Students and community members came together to help us complete the project. They would also like to thank: The Dalton Church of the Nazarene, Hwy 71 Landscape and Supply, Brooke Harrison, North Georgia STEM grant, T.J. Hornsby, and the Whitley Family for their assistance in the project! Kindergarten, Pre-First, and First grade students collaborated with 5th grade students to create a pathway beneficial to pollinators on campus. The new garden is an entryway for students to visit the greenhouse and new Makerspace area. The previously empty grass field will now serve as a living pathway to teach students about pollinators and native plants - and of course make the campus more beautiful. About 70 participants dedicated 30 hours of work to make it possible. The enthusiasm shown by the teachers and students for the project and the support of the administration played a large part in the success of the project. The group involved heard several positive comments from staff, parents and visitors. Parents also commented on the way the different grades worked so well together to complete the project. Besides the mini-grant funds CHS received $100 in plant material from the Modern Woodmen Association's Dalton area youth service club. And, CHS provided the mulch and soil needed for the project. This project enabled students to transform the courtyard into a certified wildlife habitat that will also serve as an outdoor classroom throughout the year. The project aimed to create a space that offers wildlife food, water, cover, a place to raise young, and develop sustainable practices. The wildlife habitat can now encourage students to engage in the beauty of nature, and spark their love of learning about nature and ecosystems. 40 students dedicated 4 hours to the projects installing nesting boxes, a bird bath, and several types of plants. Something good that came out of doing the project was that some of the students had never had the opportunity to do any kind of gardening. They loved the discoveries they made while digging and putting plants in the ground. The students also made a world to text connection by associating the project with a book that they were reading in the classroom. They were very eager to help and enjoyed working outdoors to make their school grounds more beautiful. At Westwood students had the opportunity to dig in the dirt and learn about how gardens grow by transforming an area of the playground that had been neglected. Thanks to the grant they were able to purchase heavy, durable tools and watering cans for the students to garden. And, they purchased enough broccoli plants, carrots plants, and butterfly bushes so that every grade level involved had an opportunity to work the soil and nurture their plants. 500 students dedicated about 80 hours of work to transforming their playground. First United Methodist Church also volunteered their time during their church's "Be The Church" volunteer efforts. Here's a note from the teacher: Some of the unexpected moments occurred when students were digging in the dirt and found "critters," especially worms:) We often had impromptu lessons on how the soil is alive and "nutritious" if there are worms present. We went on to discuss how worms eat and poop in the soil making it rich in nutrients for the plants to use and grow healthy. Another memorable and impromptu lesson had to do with the butterflies we saw on the milkweed and butterfly bushes. We talked specifically of monarchs and their struggle for survival. We discussed reasons of overdevelopment of wild places where critters like the monarchs must have for survival. It made us all stop and think about the influence humans have over the natural world, and how we must take care of nature in order to keep Planet Earth healthy. So, just by being outdoors digging in the dirt and planting, some really unique and very educational opportunities came about. During the fall season 4th graders from Brookwood built an elevated pond to replicate the Lakeshore Park ecosystem. It will contain different water dwelling creatures from Lakeshore, like mosquito fish, snails, and small turtles. These will be cared for in this temporary exhibit to provide younger students and visitors with the chance for closer observation, and function as an interactive space in our courtyard. The school will have a place where aquatic animals rescued from Lakeshore can stay and live until they are return back to the lake. 102 4th grade students participated in the project over the course of 12 hours. They designed, measured, cut pipes and pre-assemble the pond. They loved it. The best part for them was cutting the PVC pipes and figuring out the right connectors. The full project will be completed in the spring when the water pump for running water can be installed. The autism resource class gave the butterfly garden at New Hope Middle some much needed TLC this fall. Students were able to add fresh mulch and plant new plants after using their math skills to determine how much was needed. They were also able to use math to determine how many pavers that we needed. There were many good things that happened during this project. Students worked together and used social skills to complete the project. Approximately 20 participants dedicated 30 hours of work to the garden. Dug Gap Elementary recently added a new playground for 4th and 5th grade but, with no shade in sight. Students took the opportunity to begin a tree planting project. After studying the playground and communicating with their community business partners they determined they had room to plant three maple trees. With the grant they were able to purchase trees from Fiddleheads, while the Whitfield County Schools maintenance department advised on placement. 90 students participated dedicating about 25 hours to the project from research to planting. As the trees grow they will make the playground an enjoyable area for students and teachers to get fresh air, exercise, and appreciate the lovely outdoor environment. And, of course the new trees will provide shade and alleviate some of the heat. Students also got an appreciation for the time and effort it takes to follow through with a project. They had lots of discussions about the path of the sun over the school building and the time of day that they would be using the playground, and the optimal placement for maximum shade. They also saw teachers meet with many people including school personnel, utilities workers, nursery staff, and even the tractor drivers, and got a better understanding of how all the parts have to work together to accomplish a task. Students mulched and planted new plants along the front of the school which hadn't been cared for in years. The project added mulch to cover the plastic that was showing through the little bit of mulch still in place. Additionally, some hardy plants were planted into the space to add some beauty. This project will dramatically improve the overall aesthetic of the front of the school, which evidence indicates, improves the school pride culture. If students have more pride in the appearance of the school, they will take better care of the adjacent areas. In the fall 65 participants dedicated a combined 118 hours to completing the project. Also involved was the NWMS Beta Club, and a private donor who supplied additional top soil and the bulbs. Students planted hundreds of donated bulbs including hosta, canna lilies, irises and monkey grass. The mulch purchased with the grant was enough to cover all the flower beds across the front of the school. The Beta Club students provided the manpower over 3 different afternoons. Students received an impromptu lesson how how to split bulbs. For many students, it was the first time they had ever worked in the dirt or planted anything. Our beds are flush with earthworms which was interesting for students who had studied them academically yet never physically seen an earthworm. There two objectives for creating this habitat. The first is to create an outdoor classroom that students could study pollinators life cycles. The scond is to create a habitat that meets the the requirements for the Rosalynn Carter Butterfly Trail. We are going to let the ground stay covered until the first part of January. Then we are going to seed and cover the seed with mulch because most of the seeds have to be cold stratified to germinate. Also some of the plants in the seed mix take two to three years to become established. This project is ongoing and has metamorphosed into a prairie restoration project. Eastbrook Middle School was one of the recipients of Keep Dalton-Whitfield Beautiful's mini-grant initiative for the 2015 National Planting Day. Their project was "Mustang Magic: Making Plants Change Color". Many students had never planted a tree or shrub. They enjoyed it and are excited to see the results in the spring. They were shocked with the notion that the pH could alter flower color. The purpose of the Dawnville Reading Garden project is for students to see the life cycle of a flower bulb from bulb, planted in the fall, to flower, emerging in the spring. Students study the life cycle of plants throughout the elementary school years. This would be a great hands on learning project for students. This project would also add color to the Reading Garden for all to enjoy. The students really enjoyed talking about the flower parts and then actually seeing, feeling, and planting the bulbs. This garden is inspired by Claude Monet's flower garden in France. The Color Spectrum Garden was built and planted with different flowers, like Monarda Jacob Cline, Blue Asters, Orange Black Eyed Susan, Yellow Mums, Indigos and purple Tulips, which represent color spectrum, some seeds will be sown in spring (Milkweed). Bond Ragsdale, Scout member of Troop 2, helped with building and planting as part of his Eagle Scout project. There were also 5 other scout workers preparing the soil and planting. The goals with the Color Spectrum garden are: teach the students about the color spectrum, parts of the flower, cycles of the different plants, as well create habitats for insects , birds and other small creatures that students can observe, and learned about it. The students will be learning how to care the different plants. It will be an outdoor classroom for observation and inspirations for journaling in science, language arts, and art classes. 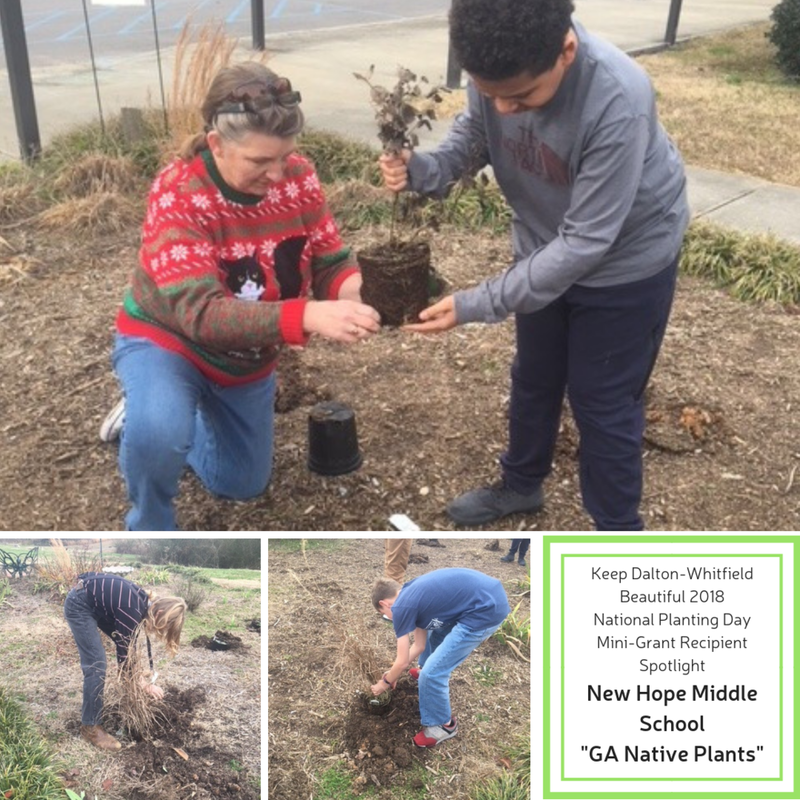 Coahulla Creek High School was one of the recipients of Keep Dalton-Whitfield Beautiful's mini-grant initiative for the 2015 National Planting Day. Their project was "Colt Horseshoe Planter". As part of the vocational instruction for special education students, students and staff from Mr. Ogas' class designed a planter in the shape of a large horseshoe made up of boxwood shrubs. The shrubs will take a couple of growth seasons to grow fully together, but the design is great and the look is still very aesthetically pleasing. Imperial Landscaping was a HUGE help. Mr. Brian Whitmore, owner, was instrumental in the success of this project. He helped with the design/layout of the horseshoe, taking care of all the finer details and making the vision come to life. 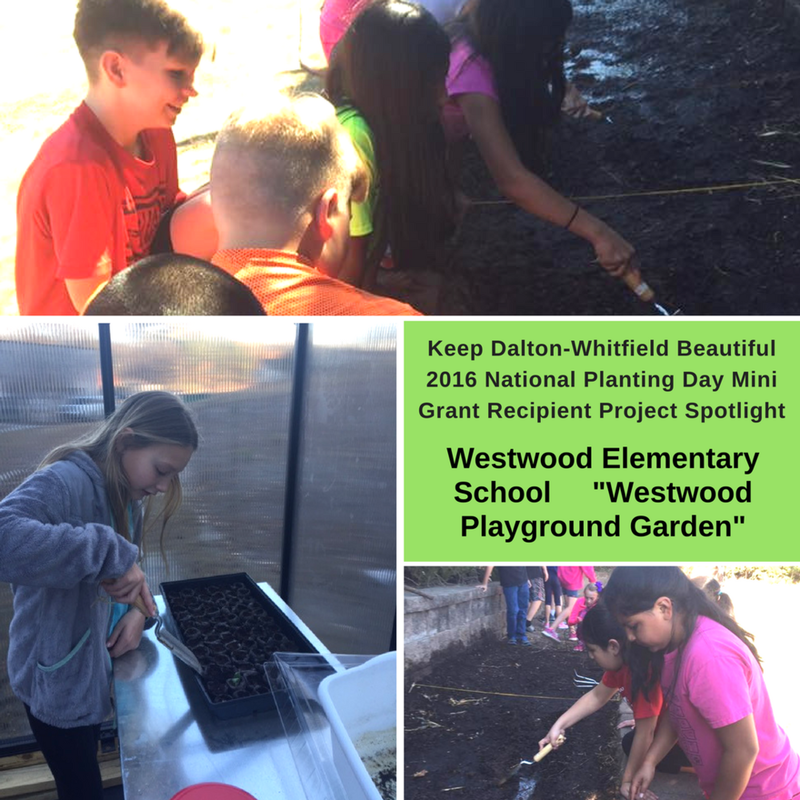 Westside Elementary School was one of the recipients of Keep Dalton-Whitfield Beautiful's mini-grant initiative for the 2015 National Planting Day. Their project was "Play in the Shade". 5th grade Girl Scout Troop 11622 members who also attend Westside Elementary School organized this project. The girls said, "One of our playgrounds is very sunny. We would like to provide a little shade for all the children that play there. Maybe even for our children to play under some day." The group planted a maple tree because they provide plenty of shade, they grow fast, they are beautiful to look at in all seasons, and their leaves are easy to clean up. 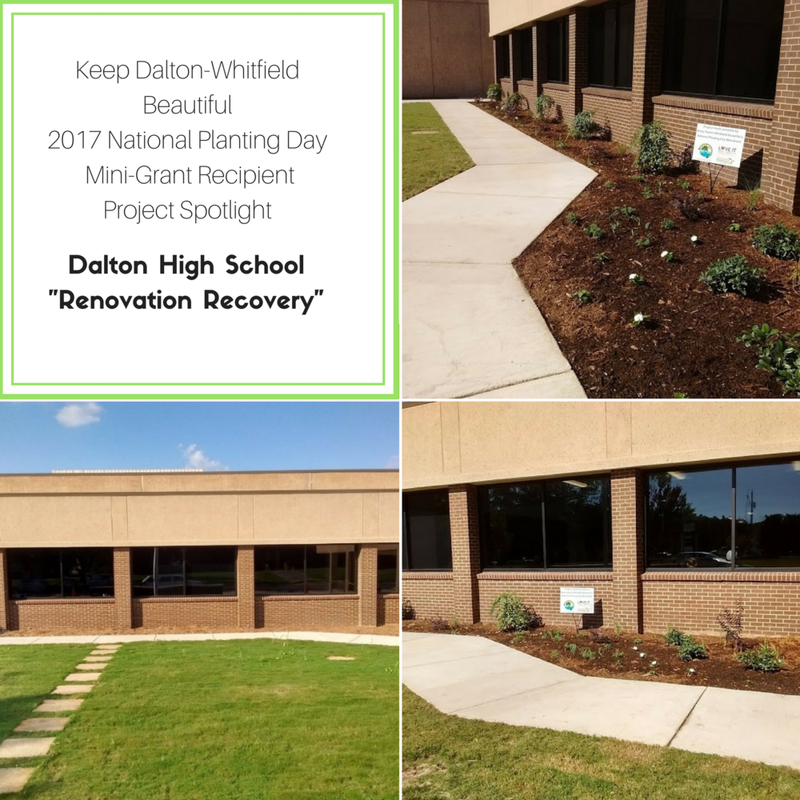 Dalton High School was one of the recipients of Keep Dalton-Whitfield Beautiful's mini-grant initiative for the 2015 National Planting Day. Their project was "Amplify Your Assets". Dalton High School Catamounts \ Dalton High School Future Farmers of America (DHS FFA) was able to beautify three major areas of our school while working with trees for the first time. In front of DHS students planted rose bushes, loripetalium, liriope, daylilys, and dianthus; on the hill next to the Agriculture classroom, DHS FFA students planted two Japanese Pencil trees and the Tiger and Webelo Scouts planted three Eastern Redbud trees; and in the rear area of DHS, students planted a Lace Leaf Japanese Maple tree, daylilies, and other perennial plants and vines. The Grant money also paid for mulch and garden and top soil to plant and help preserve the new landscaping. The most common thing I heard everyone say was "Wow - this looks so good!"